To achieve the full benefits of SurfBalance, we recommend that you disable the built-in Safari browser using the iPhone/iPod touch/iPad Restrictions feature with these easy steps, then setup SurfBalance controls and reports using these 3 easy steps. 1) Restrict Safari Usage - Tap Settings>General>Restrictions>Enable Restrictions. 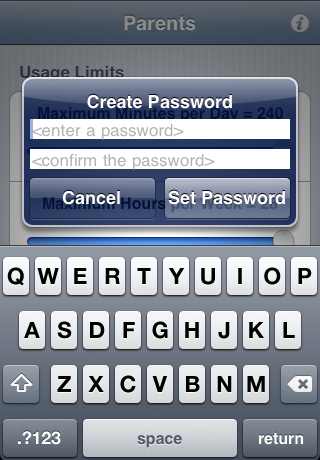 You will be asked to create a passcode so that you can re-enable Safari at any time. Switch off Safari using the ON/OFF switch. You may also want to disable other apps or features such as YouTube, etc. 2) Setup a SurfBalance Password - The first time you navigate to the Parents control tab in SurfBalance, you will be asked to setup a password and a clue in case you later forget your password. 3) Setup the SurfBalance Controls and Reports - From this password protected section, you can set user time limits, decide how much of the built in catalog you would like to display, setup individual site block/allow controls, sign up for email reports and more. For full details on each control available, click the i button at the top right on the page (also available at this link). To achieve the full benefits of SurfBalance, we recommend that you restrict access to the native device browser. For devices without built-in app controls, we recommend the use of a utility app such as Smart AppLock. 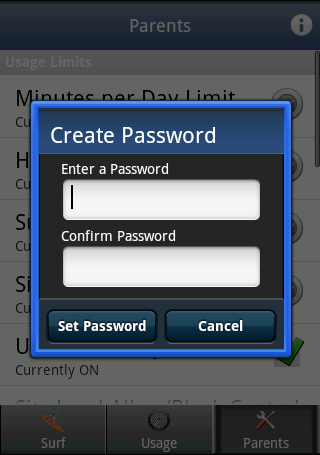 With Smart AppLock, you select apps which you would like to restrict using a PIN or secret pattern.